I find the suggestion that there needs to be a cure for autism an absolutely ridiculous notion. Coming as I do from a family where many of our men-folk exhibit spectrum behavior, spending much of their time in the garden shed whittling or inventing, my child fits right in with our collective history of quiet, deep thinkers with quirky habits. To me that’s all down to genetics and hard wiring, not so much a disease in need of a cure. Granted, our experience of Asperger’s has been what Uta Frith delicately defined as having ‘a dash of autism.’ Parents and carers of highly autistic children undoubtedly face more challenges. But how many of you out there wish a cure or is it more about adaptation and acceptance? Adaptation takes on many forms. 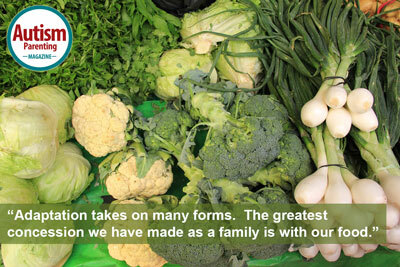 The greatest concession we have made as a family is with our food. Diet and nutrition have been a focal point of family life for the past five years and what we eat and how we eat has been tailored for the most part to my son Henry’s complex relationship with food. From aged two and a half, Henry exhibited increasingly odd mealtime habits, eating an ever-diminishing selection of foods that had to be served on separate plates. By age seven he would eat just three white foods; bread, chicken breast and dried cereal along with vast quantities of milk. He was stressed and uncomfortable around food so mealtimes were horrible and quite frankly on this limited diet he lacked energy and looked ill. Coupled with this, his behavior at school was a major issue, particularly his inability to sit still and focus. He had all the well-known social Asperger attributes but they palled compared with his physical irritability and anxiety. From a management point of view, teachers were insisting we consider medication. As all this came to a head, I realized that Henry’s perception of what he ate was something I didn’t understand and I focused my efforts on discovering how he saw food. Together over a number of sessions we covered the kitchen counter with a vast array of fruits, vegetables, meats and anything else we could lay our hands on and Henry explained as best as he could why colors, pungent smells, strong tasting foods and most textures, especially when mixed, were abhorrent to him. And we are taking about peas and tomatoes here! The list of offending foods was endless but there were a few that made it on to the ‘not-so-hated list’ and that’s where we started by introducing a little of these foods to his meal, every meal, every day until they were accepted. In addition, I fortified cakes and breads, his safe white carbs, with eggs, quinoa, cream, almond flour; in fact anything I could to up the nutrient value of his diet without him noticing. Getting broccoli, almonds (as flour) and eggs into Henry’s daily diet had an unmistakable effect on his well-being. He was at once less troubled, less flustered and more able to cope with everyday transitions. As we progressed, protein for breakfast in the form of meat and fish somehow anchored him and without doubt he was happier, emotionally stable and able to take on the day. I saw for myself the positive effects of a broader nutrient in-take. But a little Googling also showed up a ton of studies as well as anecdotal evidence that supports our experience. Dr. Alexandra Richardson from the University Laboratory of Physiology in Oxford conducted a thorough study on nutrition and its effect on the brain and concluded that omega-3 and -6 deficiencies ‘contribute to a range of developmental and psychiatric conditions’ including ADHD, autism and depression. Most crucial I thought was the broccoli, the first vegetable we introduced, that delivered a much-needed daily dose of omega-3, a key essential oil for nerve and brain function. On the flip side, we tuned in to the negative and unraveling effects of sugar in all its forms along with other white, processed carbohydrates. Henry’s beloved bread was replaced with a whole-grain fortified version and overall the balance of carbohydrate to protein redressed. At aged twelve Henry now eats just about anything and everything. So whereas three white bland foods used to feature separate plates, he now eats stews and sauces with tastes and textures that span the globe. Aligned with this extension of his diet is a clear improvement in his physical and emotional health. We have gone from ugly school meetings with head teachers about controlling behavior and a tense home-life where food was a four-letter-word to where I now have a healthy, happy boy, who only last week ate a spicy tomato and chicken stew when out at a friend’s house. So not only did he navigate a complex social situation away from home, he ate a mixed textured dinner featuring the food last to be accepted onto his plate; tomatoes! I am so proud of him. Is this a cure? No, I don’t think so. When eating just three foods Henry was lacking essential vitamins and minerals that I’m sure contributed to his aberrant behavior, that was then being attributed to his Asperger’s syndrome. From the off improving his diet made his unsettled nervousness a non-issue. Yes, I am his mother, but I do feel he’s more finely-tuned than most. Aspergers have delicate wiring (spot the non-medic!) and are anything but robust and I believe that paying attention to what they eat reaps amazing rewards. You don’t fill a Ferrari up with low-grade crude. High-grade fuel gives high-grade performance. We all know that. Henry quite obviously has Asperger’s syndrome but he’s a happy Aspie, coping well in a main stream secondary with a close group of friends. So my message loud and clear is: never underestimate the power of a good diet. Sarah Patten is mother to a son with Asperger’s syndrome and author of the book What to Feed an Asperger – How to Go from Three Foods to Three Hundred with Love, Patience and a Little Sleight of Hand.’ Sarah was born in The Lake District in Britain and after university went to work as a pollution research scientist. This job, studying the effects of pollution on sea life, including stranded whales took her all over Europe. In her mid-twenties Sarah switched careers and started writing TV shows. She has written and directed an eclectic mix of factual TV both in the US and the UK. She now focuses her energies on looking after her growing sons and writing articles and books. 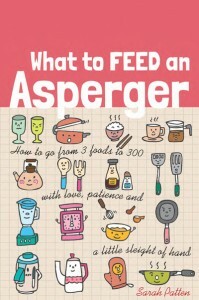 Sarah Patten is mother to a son with Asperger's syndrome and author of the book What to Feed an Asperger - How to Go from Three Foods to Three Hundred with Love, Patience and a Little Sleight of Hand.' Sarah was born in The Lake District in Britain and after university went to work as a pollution research scientist. This job, studying the effects of pollution on sea life, including stranded whales took her all over Europe. In her mid-twenties Sarah switched careers and started writing TV shows. She has written and directed an eclectic mix of factual TV both in the US and the UK. She now focuses her energies on looking after her growing sons and writing articles and books.